The beginning of our mission in Portugal is connected with the history of the Congregation in Angola. The Sisters of Cuchi wanted to have Portuguese speaking sisters in the community. Sr. Cristina Eloy da Rosa, a junior Sister, was sent from Sorocaba Priory to Cuchi, where she had her perpetual vows. The Abbot of Singeverga, who was visiting the monks in Mexico, came for the preparation for Sr. Cristina’s final profession. D. Gabriel de Sousa witnessed the dedication of the Sisters and appreciated their good spirit. Thus he asked from the Mother General, Mother Maria Lucas Rauch, to send Sisters for the foundation in Portugal, to prepare vocations for Angola. On June 9, 1961, feast of the Sacred Heart of Jesus, the “new” convent in Bande was inaugurated. The pioneering Sisters were Sr. Liobolda Fetsch, Sr. Martinha Rodrigues, Sr. Regina Lansang and Sr. Wiltrud, now Monika Zahnbrecher. The farmstead of Bande was given in testament to the Singeverga Abbey with religious finality. 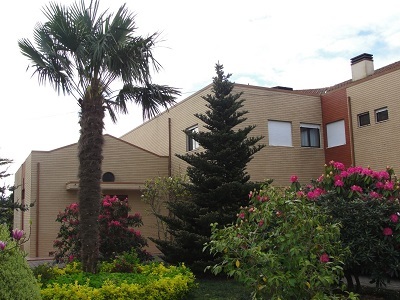 There were existing two small farm houses, two houses for the caretakers and 11.500m2 of land. The Abbey would only hand it over to us with the condition of opening a novitiate for the formation of missionaries. And the first candidates have come. In 1967, four Sisters on board went to Cazombo, Angola, for the foundation of a community. Consequently, the Congregation is recognized as Missionary Congregation in Portugal. The Sisters have had struggled so much to obtain their sustenance. They opened a school in Paços de Ferreira, a neighbouring place of Bande. The Sisters collaborated with the Social Center in Baião and gave lessons in one “telescola”, a way of learning via television wherein the pupils are accompanied with a “teacher” as they followed a program in the TV, giving lessons on basic subjects. But these two initiatives ended in frustrations. In 1967, a new offer arose in Paredes, 17 km from Bande that promises a better future. They started a school and some of the Sisters transferred from Bande to Paredes. A year after, the sisters bought a house in Baltar with vast terrain where they can construct a new school. In 1972, the three communities, Baltar, Bande and Cazombo formed as one Priory with Sr. Lúcia Jörger as the first Prioress. April 25, 1974 – the military coup brought down the government. The new regime of the government threatens the existence of private schools. In our neighborhood a state-owned secondary school began to function. In June 1977, the sisters were obliged to close the school. In 1975, the Cazombo community have had to withdraw due to civil war. The Priory of Baltar was suppressed and the community directly was made a dependent of the Generalate District. 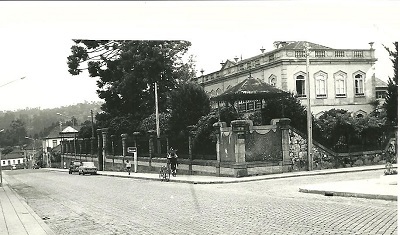 From 1977 to 1983, only the community of Baltar existed in Portugal. 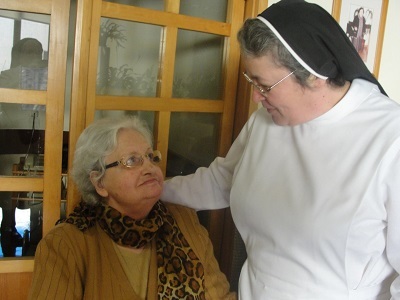 Two sisters, Sr. Plácida and Sr. Maria Goretti, were working at EMAUS, center for the mentally handicapped. Other sisters were dedicated to pastoral work or studying. In 1983, Sr. Edhilt Fasel was nominated Superior and in charged to search for another place of work. 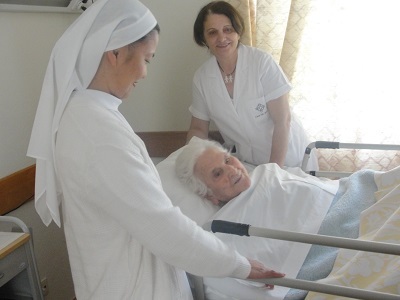 D. António Francisco Marques, bishop of the Diocese of Santarém, invited the Sisters to administer “Casa de Repouso”, the Nursing Home in Torres Novas, pertaining to Santa Casa da Misericórdia. They worked here from 1984 to 2011. 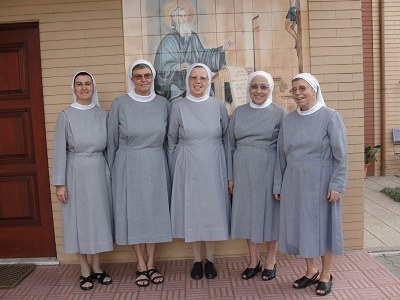 The sisters received a land beside the Casa de Repouso for the construction of the Monastery and a Nursing Home. 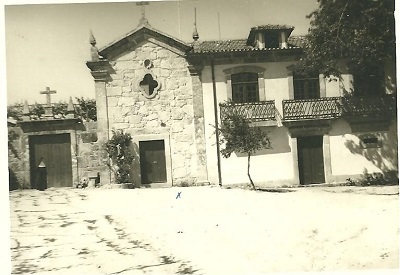 In 1966, Torres Novas became the Priory house. A year after, the communities of Spain integrated to the Priory. St. Benedict’s Monastery is the Priory house. The community is dedicated in taking care of the elderly. Our nursing home has its capacity of 37. It is a service that requires lot of dedication and it responds to the great necessity of a society which is more and more aging. In our garden, we have plenty of fruit trees, legumes and vegetables. Every Sunday, our Chapel is filled of Mass goers. We are in good relations with the parish, the Diocese of Santarém and the city. The four sisters of the community in Baltar are all retired. They are active in pastoral work: Catechism, Liturgy, Parish Council and Ministry of Communion; Visiting families, Vicentinos, Sacristy and Feasts. The sisters are very much appreciated by the population.